UPDATED – SAN SALVADOR, El Salvador (CNS) — Salvadorans must not overreact to the Supreme Court decision to declare the country’s amnesty law unconstitutional, said Auxiliary Bishop Gregorio Rosa Chavez of San Salvador. While Salvadorans must not forget what happened during their more-than-12-year civil war, people must learn to seek reconciliation, not revenge, he said. “Those who have been offended have the right to ask for forgiveness … We can’t forget (what happened), but we’ve got to know how to deal with it,” he said. The court’s July 13 decision opens the door to lawsuits from victims of abuses during the war to seek compensation. It shocked both liberals and conservatives, as members of both sides argued that repealing the law would result in thousands of lawsuits that would destabilize the country. However, the brother of one of four U.S. missionaries killed early in the war said he was not interested in pursuing legal action against anyone connected with the deaths in December 1980. James Kazel, brother of Ursuline Sister Dorothy Kazel of Cleveland, said July 15 that there is no need to pursue legal action more than 35 years after his sister’s murder. Sister Susan Durkin, president of the Ursuline Sisters of Cleveland, said the order was not interested in filing suit against any Salvadoran officials responsible for the death of one of their members. After the decision, rights defenders argued that Salvadoran officials should not seek to jail hundreds of “war criminals,” explaining instead that restorative justice efforts would better bring truth and relief to victims of the violence. “We want the perpetrators to apologize, and the country must seek appropriate mechanisms to forgive and repair, so that that does not happen again,” Miguel Montenegro, director of the nongovernmental Human Rights Commission, told CNS. “There will be no chaos nor witch hunt, but some justice to victims,” he told reporters. In its ruling, the court declared as unconstitutional portions of the amnesty law because they violated war crime victims’ right to access justice and reparation. The judges also said that war crimes do not expire and can be prosecuted regardless of when they were committed. The law was passed after the U.N. Truth Commission investigated 30 cases of war crimes, 20 of which were committed by the army, and 12 by guerrillas. 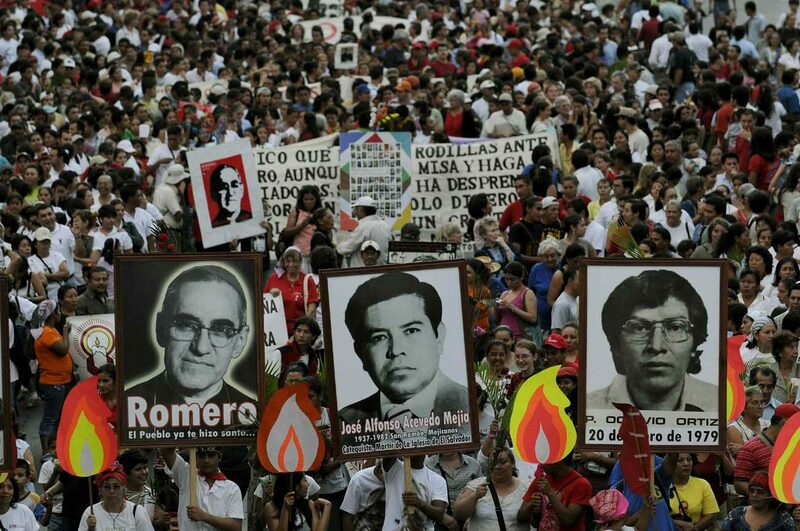 The killing of San Salvador Archbishop Oscar A. Romero in 1980 and six Jesuit priests and two women in 1989 are believe to be among the cases considered by the commission. With the law set aside, even Salvadoran President Salvador Sanchez Ceren, a former guerrilla commander, could be prosecuted. So could former president Alfredo Cristiani, who was army commander in chief in 1989 when the Jesuits were murdered. Montenegro said that before forgiveness can be given, the truth surrounding atrocities must come to light. The war left about 70,000 people dead and more than 8,000 missing. “Those opposed to justice have always invoked the amnesty law, but they can’t hide behind it anymore,” Montenegro said. Contributing to this story was Dennis Sadowski in Washington.